Thank for your interest on our 3D-Plugin for WordPress! If you have any questions that are beyond the scope of this documentation, please feel free to email via our user page contact form here. Canvasio3D is an easy to install Plugin that you can show 3D models of various formats in WordPress*. Now Responsive and with Touch Screen function. Then click the button: "Browse ..."
and select the file "canvasio3D.zip"
Before any further install, please deactivated and delete the latest version of Canvasio3D plugin! 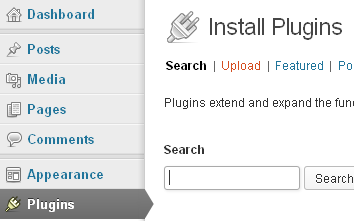 To upload a 3D-Model, select left on the WordPress Menu the Media-Button and then click "Add New". and the usual image formats such as: .jpg / .png, or .gif. The file name of a 3D model in the format: .obj with associated .mtl file must be the same, such as: 3D_Model.obj and 3D_Model.mtl. When a 3D model is displayed only black, it might be due to a texture that can not be loaded. Pay attention to uppercase and lowercase letters of the file name of the model texture, especially in the ending such as:. .Jpg or .JPG. Create a new page in WordPress and click the top of the menu selection on the tab "Visual". Highlight with your mouse to only three points in objPath "..." and click the WordPress button "Add Media". After selection of a 3D object in the WordPress Media Manager, the URL is inserted at the position of the three points. Save the page and look at the preview. Eventually, the 3D model is represented too large or too small and is therefore not to be seen. For a good view of the 3D object, you simply change the value of objScale = "0.50" into a far higher or lower value, for example: 5.00 or 0.05. [canvasio3D ... ] and ends with: [/canvasio3D]. Instead of the ... you can write single text commands like: color="#FFFFFF"
The value 2 here indicates the strength with which the frame is to be shown. All text commands needs a blank to separation and a single text command are ever: command = "value"
- Fixed a bug when displaying "Loading ..."
- New Light Sets 9 and 10 added. - Added Light-Rotation. New text command: lightRotate="on"
- Load Custom background image for each object window (Change ... with Image-URL). New text command: backImg="..."
- rollSpeedX is no longer supported. New text command: rollSpeedV=" "
- rollSpeedY is no longer supported. New text command: rollSpeedH=" "
- Floor height is now adjustable. New Command: floorHeight=" "
- Added object shadow. New Command: objShadow=" "
- Custom Object Reflection added. New Commands: reflection =" " and refVal = " "